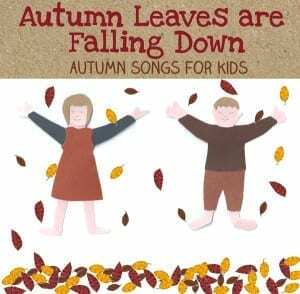 These Autumn Songs for kids are just what you need to get you into an Autumnal mood and inspire some lovely seasonal activities. 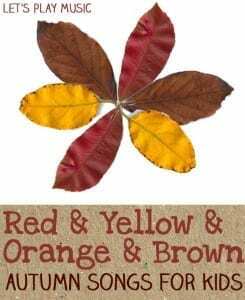 Autumn creeps up on us gradually bringing it’s golden highlights, the kids go back to school and the days start getting shorter. After all the lovely Summer fun outside, it’s time to gather the last of the harvest and get busy making jams and preserves to last the winter. 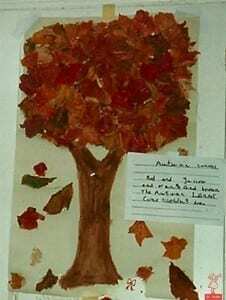 Kids always love getting involved with fruit picking and foraging, and every Autumn walk brings home a new treasure. 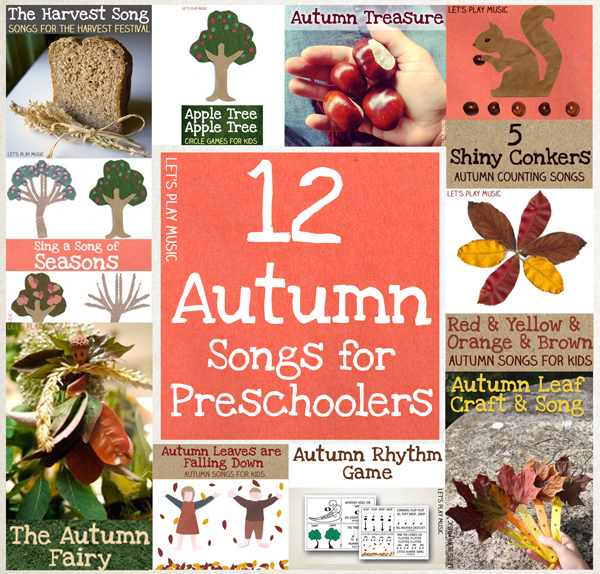 Autumn Songs for Kids with free printable resources. A very easy little action song about the colours of Autumn. 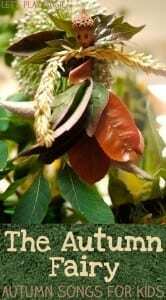 The Autumn Fairy encourages kids to go foraging for Autumn treasures to make their own fairies. 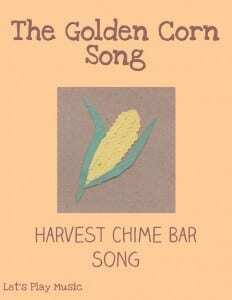 A lively song with a simple tune and vigorous actions! 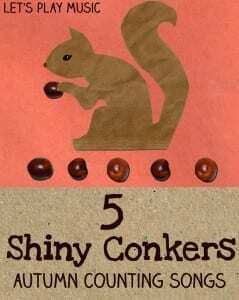 A fun counting conker song! 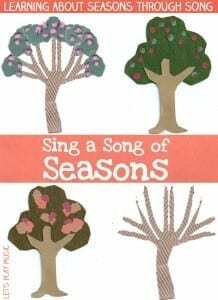 A song that explains the four seasons. 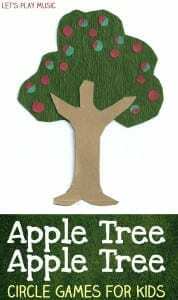 A traditional apple circle game where the apple ‘falls’ and counts you out! 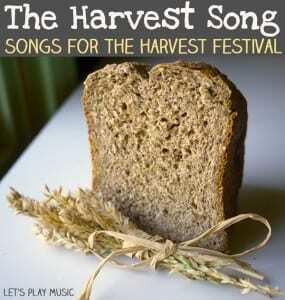 Two Harvest songs to teach thankfulness. 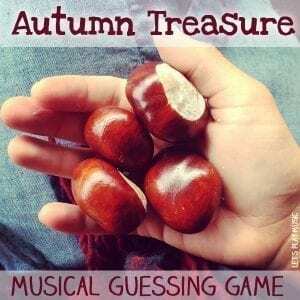 A musical guessing game about autumn treasures like conkers, leaves and acorns. 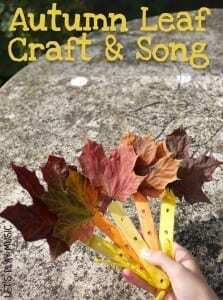 An autumn fan craft that comes with a song. 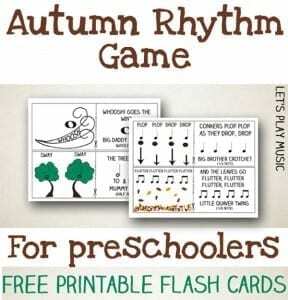 An autumn rhythm and listening game with free flashcards. 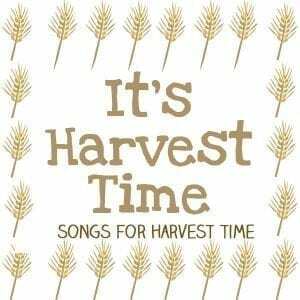 Check out my Autumn lesson Plan or the Harvest & Apples Lesson Plan for lots more lovely seasonal ideas for a harvest/fall themed lesson. 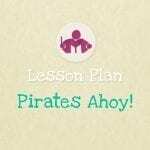 I have just bought your lesson plans through pay pal. I am so excited to take a look at them but unfortunately they have not arrived in my inbox yet. When can I expect them to arrive? 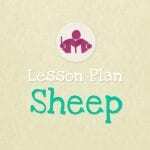 I just included a link in my blog to this entry and used one of your images, I hope it’s ok! Thanks! I’m so glad you’re enjoying our site and pleased that you find it useful. Looking forward to popping over and checking out your blog too! I have just started a new job teaching children with complex needs and am looking for musical resources and ideas to use with them.